Create your own unique, one-of-a-kind charm! Adults and children alike can create their own unique Enchanted charms that can be worn as pendants, pins or on key chains. The event attendant will assist throughout the process, teaching techniques on how to make a beautiful mirrored image design that resembles a colorful inkblot. 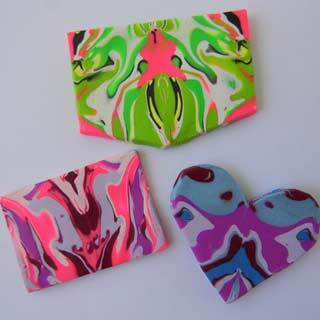 Guests choose from a variety of vibrant colors and manipulate the clay-like material into many shapes and sizes, taking about 5 minutes from start to completion, creating their own one-of-a-kind charm…no two are alike! The event attendant will trim and attach the desired key rings, necklace loop or pin back, and place in a plastic bag with simple instructions on how to bake the charm for 15 minutes to harden.